I have now sorted out the paper maps that we will be taking along. What you see below are the Jeppesen airway charts for the entire world. These are overview charts, used primarily for flight planning and printed on fairly thin paper to save weight. Generally, I fly almost paperless, but for this trip it is advisable to carry at least the airway charts in paper form, as we may need to do a fair amount of planning and re-planning as we go. I will only be taking the two binders on the left; the other charts cover those parts of the world that will not be included in our trip. All other charts, specifically airport approach and departure charts, are stored on my iPad, with a 2nd iPad in my bag as a stand-by. 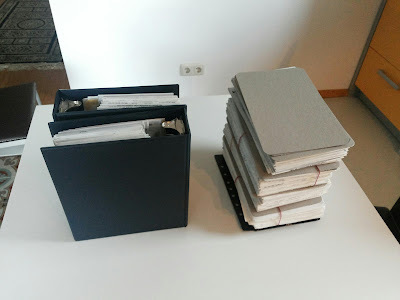 If they were to be carried in paper form, the worldwide material would not fit on the table shown below and represent a huge weight and space penalty. I am very happy to be able to use my iPad for this purpose, something many airlines have also converted to. Anyhow, just a few years ago, this was unthinkable and again I realise that modern technology helps a lot for our planned adventure. Just wondering what voltage you have on the plane for charging your I-pads and other things? Good question. The aircraft has a 28 Volt electrical system and I have sourced a few cigarette lighter USB chargers suitable for 12-24V systems. Generally however, I am not relying on the on-board charging system and typically conserve power so that the iPad lasts through the flight. Ich als Nicht-Aviator werde Euch verfolgen und bescheinige Euch schon jetzt den Erfolg Euerer Reise. Mit einer derartigen Vorbereitung wird Euch die Freude an der Reise gewiss sein!